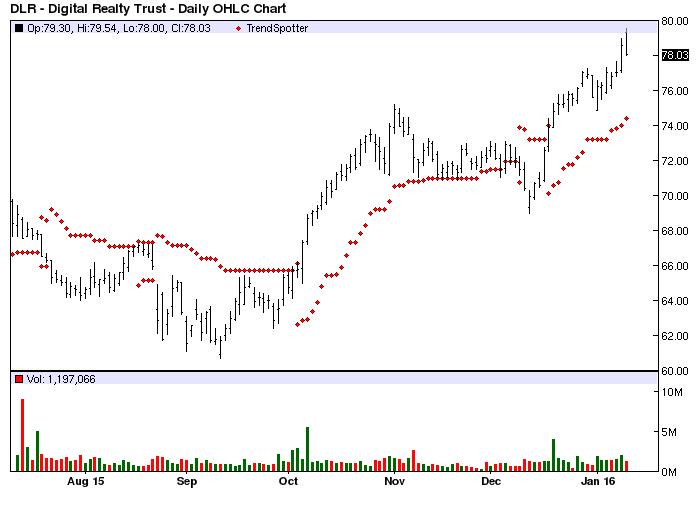 The Chart of the Day belongs to Digital Realty Trust (DLR). I found the high tech realty stock by using Barchart to sort the 52 week high listfirst for stocks with the highest number of new highs in the last month, then I used the Flipchart feature to review the charts. Since the Trend Spotter signaled a buy on 12/17 the stock gained 5.89%. Digital Realty Trust (DLR) owns, acquires, repositions and manages technology-related real estate. The Company's properties contain applications and operations critical to the day-to-day operations of technology industry tenants. This is one of those stocks you shouldn't be trading but buy, hold and put your dividends on a DRIP to compound over time.